There’s no denying that Aston Martin is in the business of making cars look and sound like wonderful, mechanical works of art. These aren’t things people buy simply to satisfy a basic craving. A desire enters the mind, and it must be satiated. This desire can start down in your brain, your heart, or in the pit of your stomach. Ultimately though, it will take over your entire being. This is what I imagine it’s like to put an Aston Martin-branded machine into ones garage. 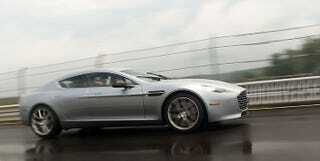 When one thinks of Aston Martin, they no doubt think of the glorious V12 engines. There’s the fantastic bodywork to behold, and the aural notes that fill blissful ears for miles. Still, one most likely thinks of coupes when the automaker’s name is brought up. The long line of Vantage and DB variants are the supreme beings on planet Gaydon… but there exists another creature that’s trying to break from the pack, without losing sight of where it comes from.